State Rep. Steve Stafstrom speaks at a press conference Feb. 5 on legislation that will be introduced during the 2018 legislative session that would ban bump stocks and "ghost guns" in Connecticut. 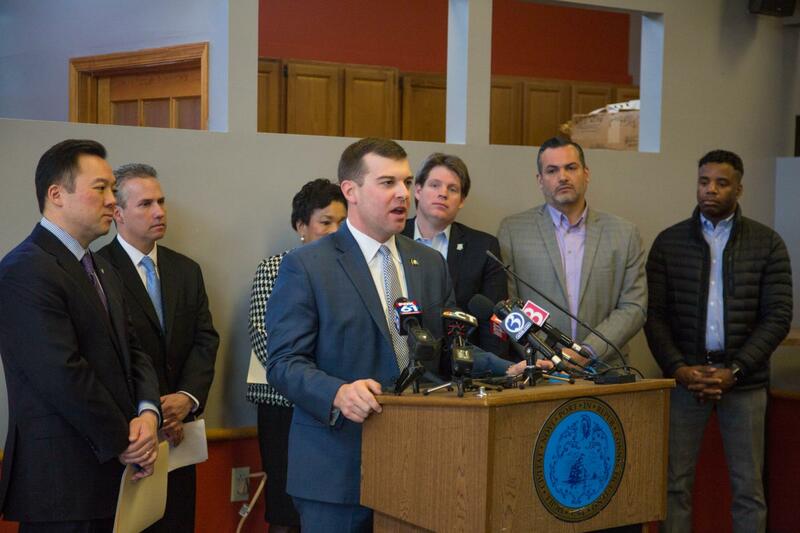 Yesterday I joined Judiciary Committee Chairman William Tong, New Haven Mayor Toni Harp and members of the New Haven Delegation in introducing two pieces of legislation to help keep automatic weapons and illegal guns off our streets and out of public places. By banning “bump stocks” like those used in the Las Vegas massacre and by prohibiting people who cannot legally purchase a gun in Connecticut from skirting our registration requirements by mail ordering “ghost guns,” we honor the intent of our existing state law prohibiting such possession and help keep guns out of the hands of those who should not hold them. The gun laws as they are written here in Connecticut say that automatic rifles are not allowed. When a bump stock is added to a semiautomatic rifle you are making it an automatic rifle. As a policy of this state, we’ve already decided that automatic rifles should not be on our streets, in our schools, in our movie theaters, or in any place in Connecticut. By passing a ban on bump stocks, we’re making sure that we honor that intent of the law as it already exists. Similarly, following the tragic events in Newtown and the plague of urban violence for decades in our state, we decided that you must register a firearm and go through certain background checks to legally possess a firearm in Connecticut. Ghost guns, also called 80 percent receivers, allow people to assemble guns at home, evading background checks. Without serial numbers, the guns are untraceable. By allowing people to mail order pieces of a gun and skirt the laws of the state, the intent and the spirit of our laws is not being followed. These bills should have a public hearing before the Judiciary Committee in the coming weeks. I truly hope that every member of the legislature recognizes this year that the legislation we’re proposing is intended to get illegal guns off of our streets and to make sure that the spirit and intent of our laws are being followed. To view Stafstrom's full remarks on yesterday's press conference on bump stocks and "ghost guns," please click here.